It’s hard to say if Rajon Rondo has hard feelings towards the Boston Celtics for some reason. He certainly seemed overly motivated leading the Dallas Mavericks to 119-101 win over his former team, suddenly looking like he’s actually trying hard and not just waiting for his contract to end or get traded. 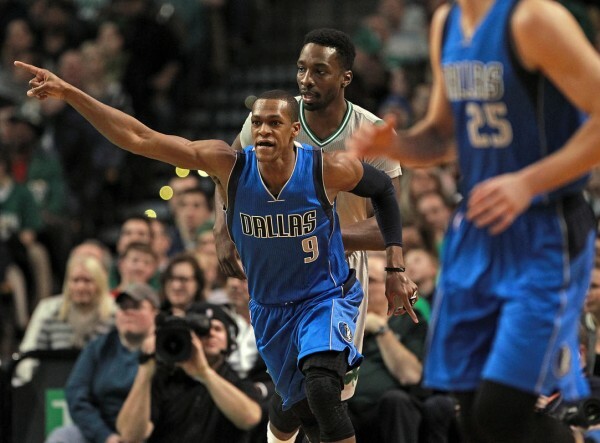 Rondo got what he wanted – no longer being on a team he helped break up with his personality and behavior and is now playing with Dirk Nowitzki, Chandler Parsons and Monta Ellis. He finished with a season high 29 points, including an incredible five 3-pointers and managed to stay away from his greatest weakness – free throw shooting. Whether this was something he stored especially for the Celtics or simply him exploding on a rare night, it was definitely unusual to see him so competent when shooting the ball. Since joining the Mavericks, Rondo has almost doubled his scoring average (from 8.3 to 15.4), shooting 46.6% from the field and 53.3% from beyond the arc. It might have something to do with being on a much better team, with a lot of players who command special attention from the defense. But from what we’ve seen from Rondo over the last two seasons and throughout his career, it might have more to do with him actually giving a damn again. On a more personal note, if you’ve been following us you might have noticed we’re not huge fans of Rondo as the person he seems to be. Before the game with his former team, Rondo said he hasn’t been playing on defense for almost two years. It doesn’t take a lot to figure out here. The moment he saw things falling apart around him, Rondo stopped trying very hard. His numbers since joining the Mavericks (although playing with better players does make it easier) might be proof of that. The improving defensive numbers for the Mavericks show he’s doing quite well on the defensive end too. Rondo was never and will never be a point guard who is valuable to a franchise as Chris Paul, Russell Westbrook, Derrick Rose, Stephen Curry, Steve Nash in better days and a few others. He’s good when there are scorers around him, which helps him show off his passing skills and keeps him motivated. But putting him as the number one guy on a team is a huge mistake, which makes paying him like one a huge mistake as well. Someone might actually get that part wrong once he becomes a free agent, because they haven’t been paying enough attention to when Rondo is actually good.